A look at propaganda, the internet, and new activisms. 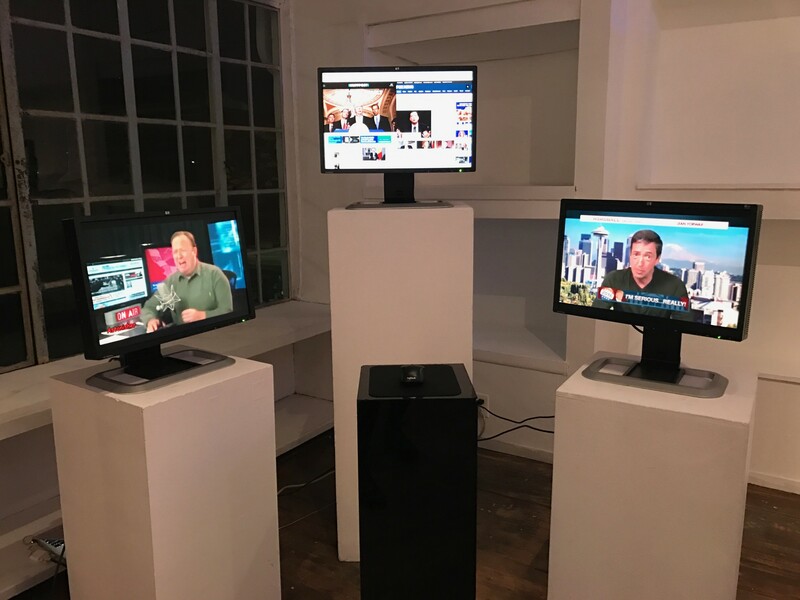 The artworks in Believe the Hype, which Newton solicited and selected from an open call for submissions, explore our so-called “post-truth” era of filter bubbles, hyper-partisan shills, and political polarity — all closely bound, the show suggests, to a great crisis in the media. The show features a dozen artists, about half of them local, working in various mediums to complicate or elucidate how we generate and distribute information. 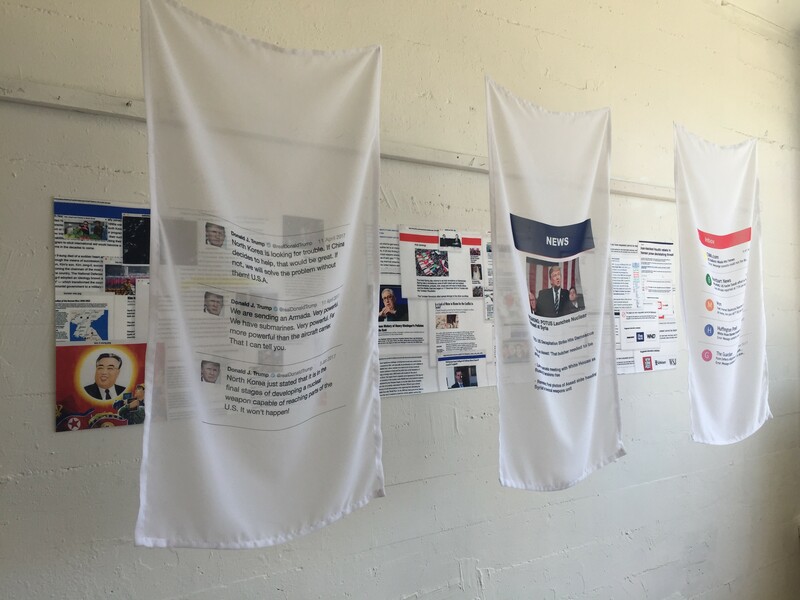 That means analysis of the political spectrum that composes the “alt-right” online (Caroline Sinders’ “Things Are Rarely Binary”), speculative social-media headlines printed on fabrics (Lucia Goodbag’s “Alternative Facts”), and an automated Twitter account (Ben Lerchin’s “#fakenewsbot”). Believe the Hype exposes the bitter ideological battles behind even seemingly neutral reportage in the digital age. Caroline Sinders' “Things Are Rarely Binary”. 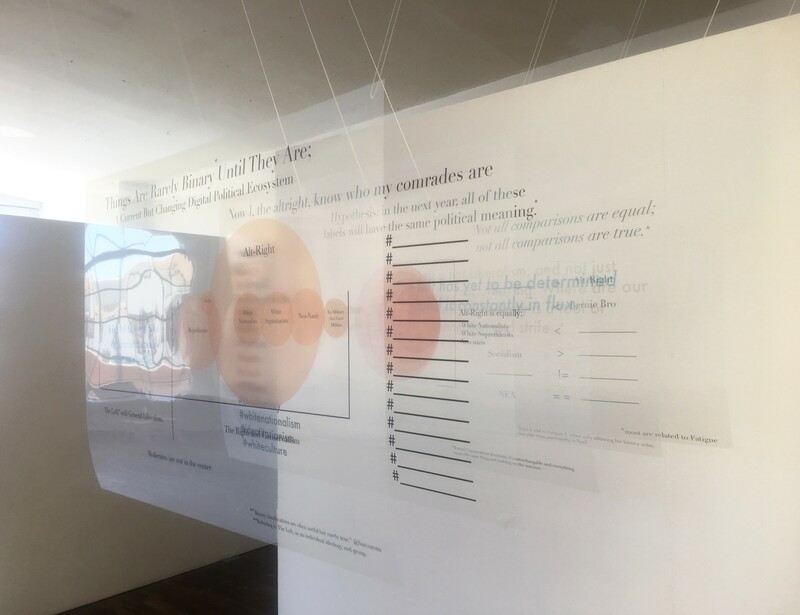 On view at B4bel4b Gallery in Oakland Chinatown until June 17, Believe the Hype: Propaganda, the Internet, and New Activisms hosts a closing ceremony entitled “Poetics of Propaganda,” presented by Newton’s journalism-in-verse publication Poets Reading the News, on June 16. It’s easy to forget that “fake news” entered the popular lexicon to describe the mostly right-wing propaganda pieces vying for virality on Facebook, since Donald Trump started flinging the phrase at any and all unflattering coverage of his presidency. That sort of amnesia characterizes news consumption since the election, as the scoops and denials and gaffes arrive in dizzying succession (especially if you get breaking-news push-notifications). Tiare Ribeaux and Elle Aviv Newton's Toward a 2020 Internet Armistice. So, the news can be injurious. It can also be wrong. @CongressEdits, which shows what entries are edited from within congressional offices.) Amsterdam research and design collective Metahaven’s “Black Transparency” video touches on a similarly simmering struggle, one between whistleblowers and the increasingly omnipresent surveillance state they look to expose. Believe the Hype will remind you of the media’s fallibility and blind spots, shortcomings and subjectivity. (Anonymous YouTube user Black Child’s conspiratorial network TV mash-up, apparently included for ideological diversity, even looks to inspire a Steve Bannon-style, out-and-out hostility toward the fourth estate.) But the show is ultimately less of a news takedown and more of a prescription for better reading. You’ll wonder if the media is really more biased today, or if its cultivated façade of objectivity has simply eroded — hastened by Trump’s tendency to double-down on misinformation where other public figures equivocate. Mainstream reporters’ tone and style tics are meant to convey dispassionate neutrality. Now that more readers recognize those gestures of authority as rhetorical devices, distrust abounds, and outlets that foreground their slant seem increasingly credible. Indeed, to some readers or viewers, overt bias is ennobled as “honest” pushback to the prevalence of political correctness.